John Szeluga Comedy: Corned Beef in Space, Amazingtown and Free Comic Book Day! Corned Beef in Space, Amazingtown and Free Comic Book Day! Chris Sorrentino and I recorded two episodes of the Super Live Adventure Podcast while we were out in California, the first of which is now available on iTunes, Stitcher, and SuperLiveAdventure.com! I want to thank Sarah Pouzar (Chopped: Season 18, Episode 4) and Ezra Donellan (Kilgore Trout is Dead) for letting us record in their garage, and for being amazing guests. We were also joined by Pavel Martinez (Endless Sky), Frank LaMonaca (Industrial Light and Magic) and my wife, Christine. If you're a fan of the Super Live Adventure Podcast, please leave us a review on iTunes! I'll be returning to Amazingtown on Tuesday, April 28th for another night of stand-up comedy! I co-produce this free weekly show with Tim Duffy, Lukas Kaiser and Sue Smith at 8:00 PM every Tuesday at Bunga's Den, 137 West 14th Street, NYC. The week's show features performances by Dave Hill (NPR), Charlie Kasov (Guy Code), Julia Johns (Girl Code), Madelein Smith, Rachael Parenta, Adrian Todd Zuniga, and Andy Farnsworth! This Saturday, May 2nd is Free Comic Book Day! Come by JHU Comic Books (299 New Dorp Lane, Staten Island, NY) for some free books, then hang around until the store closes at 9:00 PM for a special live recording of the Super Live Adventure Podcast! 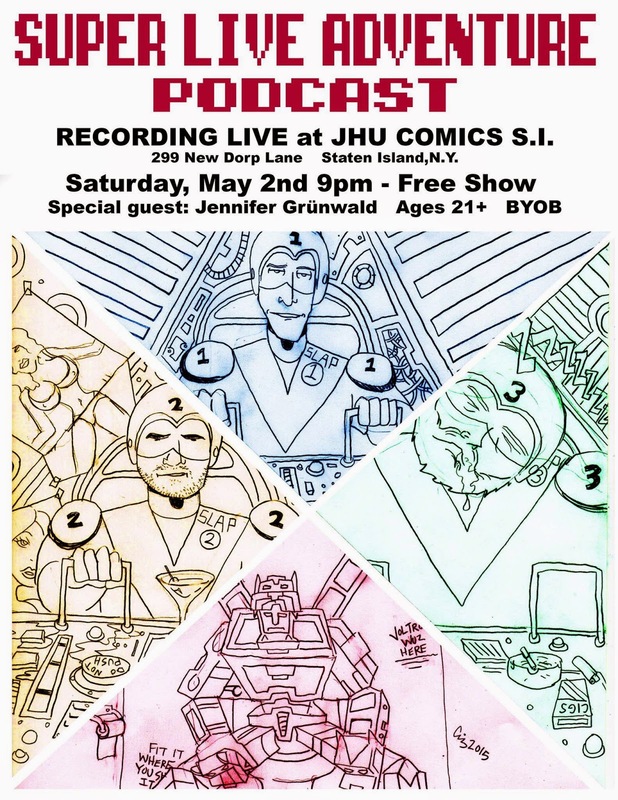 Bryan McGuckin will be returning to host with Chris and myself, and our guest will be Marvel Comics editor Jen Grünwald! Jen used to work at JHU, and she's been one of my best friends since high school. This is going to be an amazing show, so BYOB and come be a part of our live audience! 2 Brewery Shows Without Me!